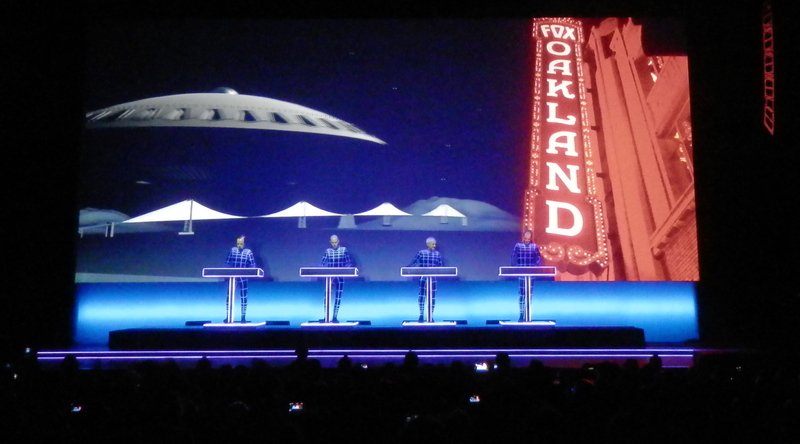 German electronic music pioneers Kraftwerk brought their 3D show to the Fox Theater in Oakland March 23, 2014, followed by two additional nights at the venue. 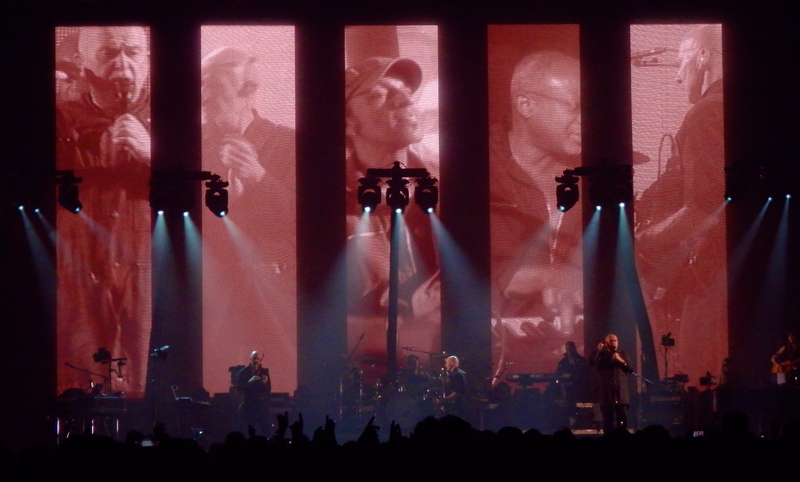 The hook for this tour is that it includes high definition 3D films synchronized to their music. Upon arrival we were each given cardboard 3D glasses which actually worked very well. It was a fantastic show highlighting most of the best material from Kraftwerk’s long career, which dates back to 1970, with the added bonus being the impact of the visuals. As for the performance, the four band members stood nearly motionless across the stage in front of small keyboards, playing a few notes live, with most of the music pre-programmed for the evening, as has been the norm with many acts in this genre. The band themselves wore body suits adorned with white parallel lines reminiscent of Tron, and these along with their keyboards became part of the visual impact during the show. Given the band members lack of movement, these sights were key to keeping the audience engaged and entertained. 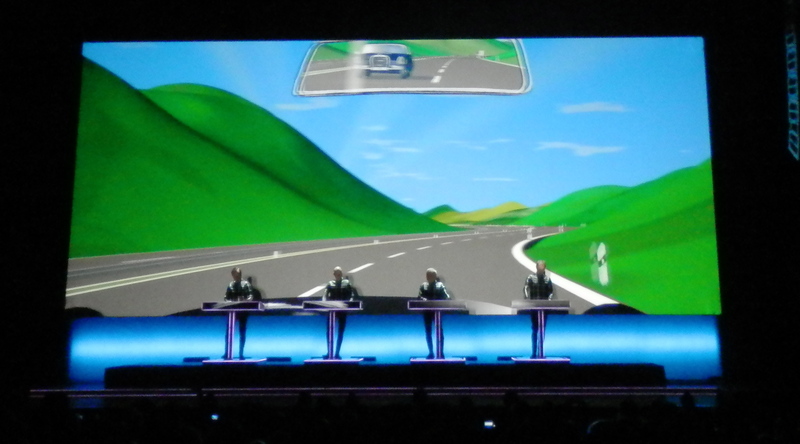 The songs playe d included the title track from each of their primary albums, including “Autobahn,” “Radioactivity,” “Trans-Europe Express,” “The Man-Machine,” and “Computer World,” along with the single “Tour De France” and selections from Electric Cafe. In addition to these nearly all of The Man Machine and Computer World albums were performed. These were programmed to match the 3D visuals which included images and artwork portraying the topics covered in the lyrics, whether robots, Volkswagens on the autobahn, trains, a pastiche of neon signs or cyclists. Some aged black and white films were also used effectively particularly during “Tour de France” and “The Model.” The 3D effects were of the highest quality, with lyrics, numbers, and various objects pointed towards the audience to capitalize on the format. Vocals are delivered by the only remaining original member of the band, Ralf Hutter, in a flat passionless manner, sometimes via vocoder, which has always been a very effective way of reinforcing the image of machine produced music, and the man machine connection. In contrast, the melodies are simple, warm, and often beautiful, such as heard on “Neon Lights” or “Computer Love.” Though credited with influencing the techno and electro movements, this is more pop than dance, and there is a bit of meaning in their art to ponder as well. In a fun gesture, at the end of the track “Spacelab” a UFO was shown descending in front of the marquee for the Fox Theater, to enthusiastic applause. 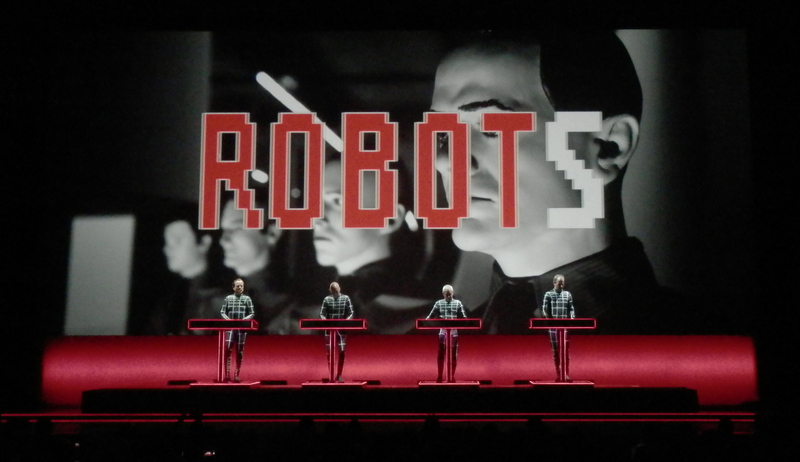 After so many years, Kraftwerk still resonate as pioneers of the electronic music form, and their live shows are a testament to them staying current, relevant, and part of today’s 3D world. 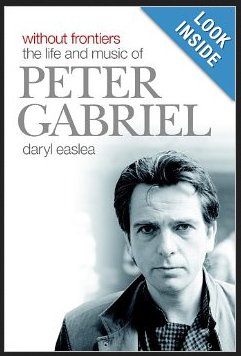 In his new new biography, Without Frontiers: The Life and Music of Peter Gabriel, author Daryl Easlea manages to craft a definitive look at the man and his art. Peter’s life, music, performances, videos, productions, and charitable endeavors are covered in depth from the late 1960’s when forming Genesis up to today. The book is very well researched, as Daryl takes care to include frequent direct quotes from Peter, his band members, management, and friends. I found his inclusion of remarks by key collaborators including Peter Hammill, Richard MacPhail, and Daniel Lanois particularly interesting and revealing. These observations contain insights into not just Peter’s work, but his life, such that the reader really gets a sense of him as a person. One interesting angle I’d not known was his lasting but friendly rivalry with Tony Banks and it’s impact on their early work together. Daryl’s skilled narrative and storytelling manages to breathe new life into every chapter as he explores Peter’s influences, his focus on quality work, and continued ability to innovate and entertain. Many fans of Genesis and Peter’s work who have read some of this information or seen documentaries in the past, will still find new revelations here. His formative years fronting Genesis are key to his development as an artist, and their work to many represents the golden age of progressive rock music. These times are treated with an attention to detail and the author takes care to incorporate parts of the story that add clarity to that short period of time, including matters both serious and entertaining. After exhausting those years, Peter’s early solo career is examined in a way that sheds light on his search for direction as a solo artist. Every key development from 1977’s Car (as Daryl refers to Peter Gabriel 1) through to 1982’s Security is illuminated. I learned new facts about this era even though this is a time in particular when I was old enough to be a devotee of every album release, concert, and news item about the man. The rest of his career from his breakthrough, more commercial release So, to the Scratch My Back and New Blood Orchestra work is also well covered, along with his frequent charitable work. Often videos and filmed live performances are given short shift – not here – for instance it was a pleasure to see someone hail the 2013 Live in Athens DVD release as a spectacular document of Peter playing live near the end of the So tour in 1987. This is a truly wonderful biography of one of the most amazing artists of our time. Highly recommended.